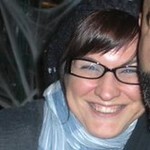 I need spring. I need warmth on my face and buds on the trees. I need the excitement over the anticipation of the early crops; knowing farmers markets and road side stands will soon be a plenty. In honor of Valentines Day, I decided to whip up a little something in Red. 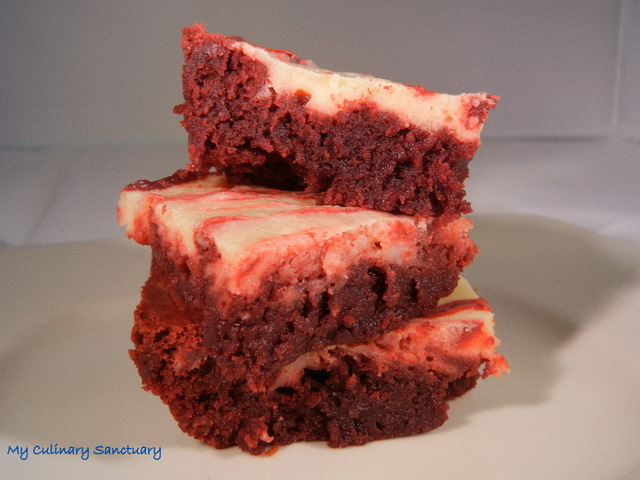 I made a batch of red velvet brownies with a cream cheese swirl. I was going to attempt red velvet cheesecake, but it’s just me and Jeff this weekend so I went with a small batch of brownies. These brownies are out of this world. They are so moist and the cream cheese flavor doesn’t take over. I love the deep red hue as well. Needless to say these didn’t last long. Preheat oven to 350. Butter a 8 inch baking pan making sure you get the corners real good. In a medium sized bowl sift together flour and salt. In a large bowl or kitchenaid mixer whisk together the sugar, eggs, vanilla and food coloring. Slowly add in flour mixture to wet ingredients and beat until just combined. Spread mixture into greased baking pan and spread evenly. Beat cream cheese, egg, sugar and vanilla together until smooth. Dollop onto brownie batter and swirl with a knife. Bake for 35 – 40 minutes, until toothpick comes out clean. I love Italian food oh so much. In my little corner of Wisconsin it’s hard to get authentic Italian cuisine. You pretty much have to make it yourself; which I did. About once a month I head down to Milwaukee to make it to one of the best Italian supermarkets in the Midwest…Glorioso’s. When I’m there I stock up. I noticed they had thinly cut pieces of flank steak in their frozen section and decided that braciole (pronounced Brah-shool) would be what I would make my family that night. 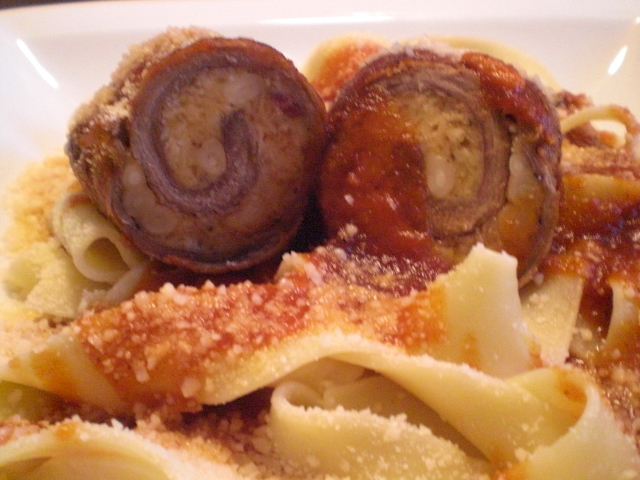 Braciole is beef that has been pounded flat and stuffed with cheese and bread crumbs. 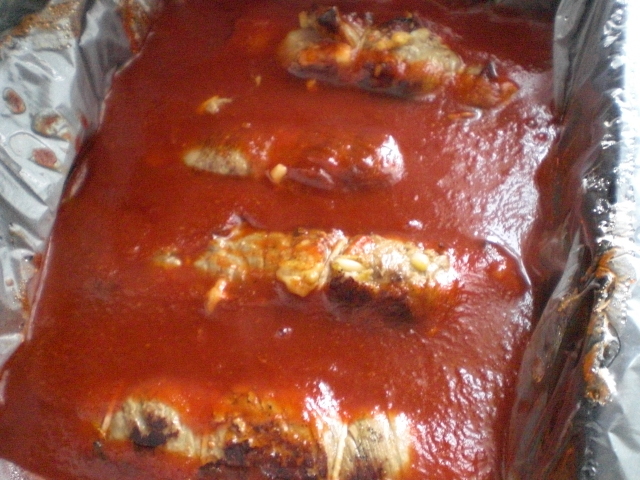 The braciole is rolled and tied and simmered in tomato sauce for a few hours (or all day in a slow cooker on low). 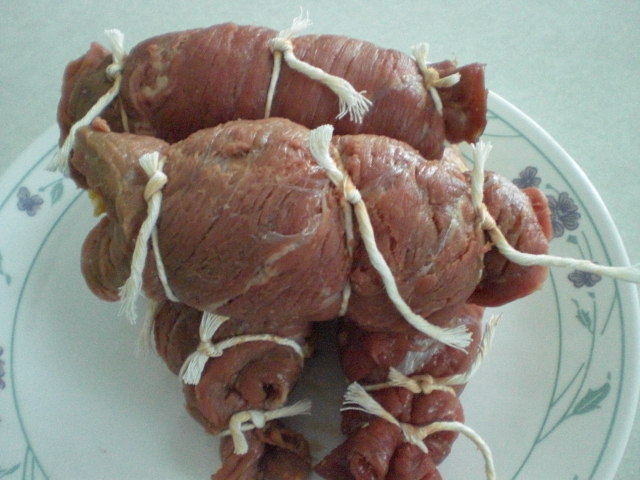 Let me start off by staying making braciole is a labor of love. It’s not hard to make per se, just time consuming. It is worth every bit of effort. 1 lb flank steak, thinly cut. If you can get your meat guy to cut it, the ideal width is 1/4 in thick. You need to pound your flank steak until it’s as thin as you can get it. You can leave the steak whole and and have one big roll or you can cut your steak into portions. I opted to cut my steak into portions. 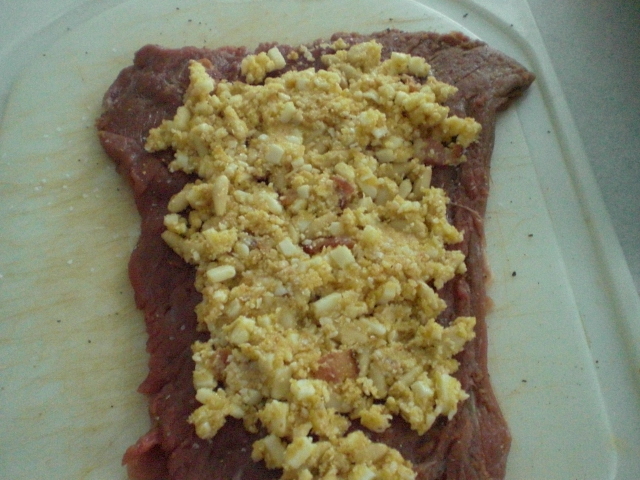 Once you get your flank steak pounded thin set aside in the refrigerator and get going on the filling. In a medium sized bowl mix mozzarella, parmesan, pine nuts, bacon, bread crumbs and beaten eggs. Season with salt and pepper and mix together with a fork. The filling will be thick, yet spreadable. 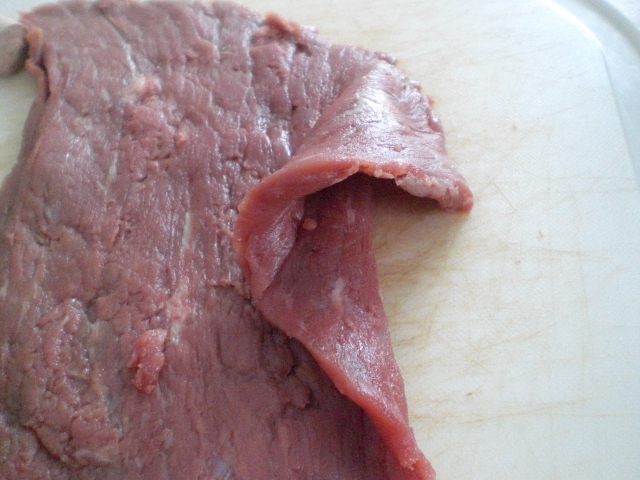 Take your flank steak out of the refrigerator and lay a piece down on a cutting board. Take as much filling as desired and spread across meat leaving about 1/4 in around the edges. You don’t want to over fill or most of the filling will come out at the end when rolling. 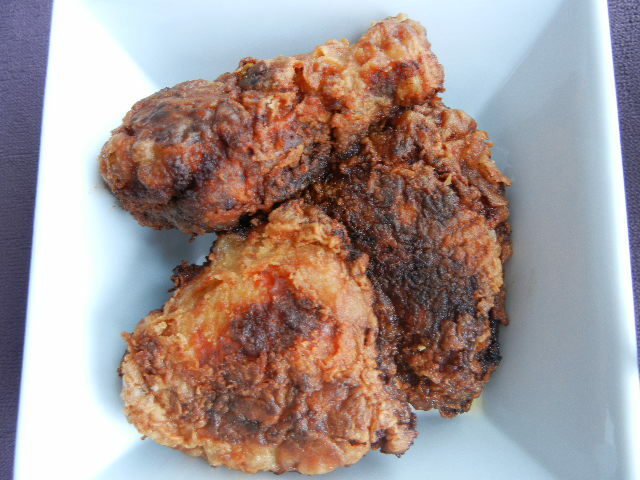 In a large skillet, heat oil until you see wiffs of smoke. You want a good hot pan to sear your braciole. In a dutch oven or slow cooker have your tomato sauce simmering. Sear on all sides until you get a nice crust all the way around. Don’t worry if you get some darker spots on your meat, they will soften up and cook down while simmering in the tomato sauce. Gently drop your browned braciole into simmering tomato sauces. Cover and let simmer. If you are simmering on a cook top, simmer for at least three hours stirring once or twice every hour. If you are simmering in a slower cooker (like I did) set it at low and simmer at least 5 hours. Stir once per hour to make sure nothing sticks to the bottom. Once done, your braciole will be fork tender. Snip off the kitchen twine and serve with your favorite pasta. I like to top mine with more grated Parmesan. I love this dish so much. I hope you do too.